On this Independence Day, the 4th of July, I decided to pull together some quotations on the holiday and the themes of the holiday from that most American author and satirist, Samuel Clemens (a.k.a., Mark Twain). I just finished listening to an audio book, biography of Clemens—Mark Twain: A Life, by Ron Powers. Absent further research and having only read Twain’s fiction, it seems to me that Powers did a fair rendering of Clemens’ life and therefore, I must admit, I came away with a less than glowing vision of the man but a new appreciation of the writer. Regardless, Clemens’ wit and sarcasm combined with a genuine appreciation of his freedoms—great American traits—make him my muse for the day. Statistics show that we lose more fools on this day than in all the other days of the year put together. This proves, by the number left in stock, that one fourth of July per year is now inadequate, the country has grown so. Many public-school children seem to know only two dates—1492 and 4th of July; and as a rule they don’t know what happened on either occasion. Ah, well, I am a great and sublime fool. But then I am God’s fool, and all his works must be contemplated with respect. 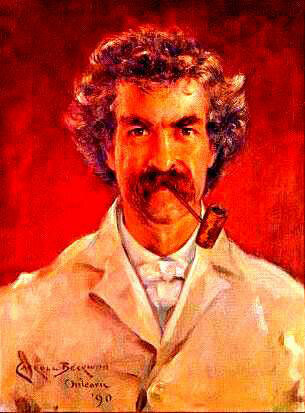 This entry was tagged 4th of July, author, biography, holiday, Independence Day, Mark Twain, quotations, quotes, Samuel Clemens. Bookmark the permalink.